Apollo was primarily a US brand until a few years ago when they decided to hold a “grand opening” for their online UK shop which, to be honest, was not grand at all. In fact, we had trouble finding any media coverage about their UK launch. Apollo is definitely a top e cigarette company, and is certainly a very high quality e liquid provider. One of the main reasons is because every e cig brand manufactures some part of their e cig in China. Not Apollo. All of their products are made in the USA by certified American engineers (not standard factory people). The results of their products? Let’s see below! Battery Performance: Advanced & powerful batteries. Wide range of wattage plus TC control options. All-around supreme performance. 8-12 hours of usage. Vapour Volume: Apollo is also known to be wildly consistent regarding vapour volume. Thick clouds no matter the device. Throat Hit: Strong and impressive; recommended by most vapers. May be considered too strong for beginners. 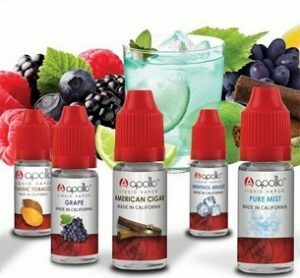 Flavour Quality: Apollo flavours are known to be the most consistent on the market. In-house production, made in the USA. Nicotine Info: Pharma grade nicotine. Manufactured in a clean lab. Size and Dimensions: Kits from 5.5″L x 0.9″D x 5.7oz (VTUBE) to 0.74”D x 4.06”H x 2.13 oz (OHM Go) – a range of various sized kits. We will give you a hint of what’s to come in this review: the only thing we did not really care for was the Apollo box design. The inside of the Endeavour kit, which is what we ordered for the review, is sleek and elegant. The tanks are situated beautifully inside stylish red velvet casings. Next to it is the accessories box where you can find your e liquids, chargers and other accessories. In short, the inside compartment is excellently designed and you can see that Apollo put serious thought and effort into it. However, the outside of the box tells a different story. It is plain and dull, red and white. The only glossy looking part of the outer layer is the ‘A’ logo that stands for Apollo. It is clear that this logo was meant to resemble a spaceship. The neat thing about this logo is that Apollo is foreshadowing here: they want you to know their products are out of this world. 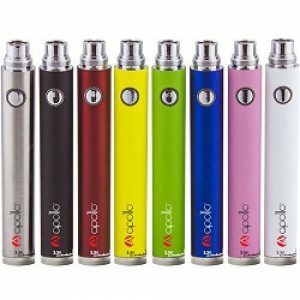 The Apollo Endeavour Kit, which is an eGo type mod, comes with two standard 900 mAh luminous batteries which is a pretty good value. The battery itself is not glossy; rather it is very practical for everyday use with a nice rubber grip and is light weight. Turning on the battery is unique whereby you must click the on/off button five times to turn it on or off. A red light lets you know that you are at full charge; blue lets you know that the battery is running low; white means it’s out of juice. This 900 mAh battery is more powerful than a 2 piece battery such as Green Smoke’s KR808D battery. 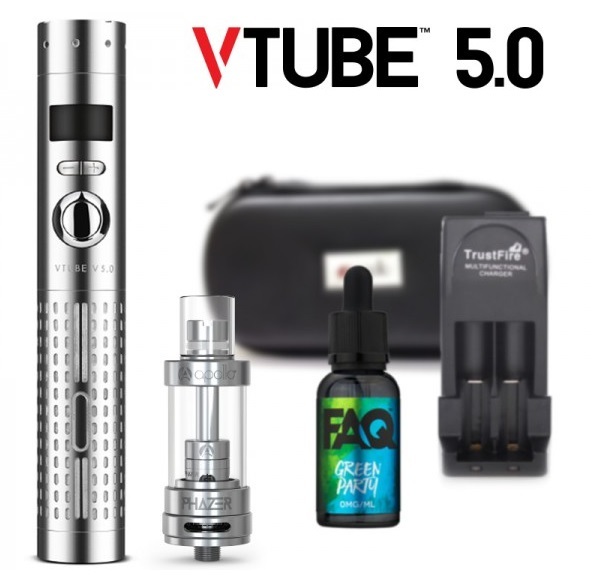 So, this allows for a stronger and thicker vapour hit than a 2 piece cartomiser type e cigarette (this is generally the case with tank systems and why it is so popular amoung vapers looking to upgrade from the cartomiser e cigarette). Since we only tested out the 900 mAh battery, we can’t comment on other Apollo battery performances. However, we can say that this 900 mAh battery allows you to puff roughly 600 drags from full to dead. That’s an astounding 12 hours of standard vaping usage! As for charging time: it wasn’t as bad as we thought for a powerful battery like this. From dead to full, it took us just under four hours to charge. That may be roughly 25% more than standard e cigarette batteries, however those standard batteries aren’t lasting you 12 hours of vape time. Anyone who has used the Endeavour Kit knows that the highlight is the vapour volume it produces. Apollo is known for its consistency in both vapour volume and flavour (which we will get to below). Additionally, many e cigarette companies are known for producing “airy” vapour. What do we mean? When we inhale other e cigarettes like Blu, we feel a bit of air; the vapour is not as tight as you would expect. However, the Endeavour Kit far outperforms most kits in this regard. You will get a full sense of vapour – as if you are really inhaling pure vapour. The only downside could be that it is too strong for beginners, so vape carefully. Due to its power, the throat hit is considered impressive by many advanced e cigarette users. We love a strong kick; it is much more preferable to a weak kick that so many e cigarettes give off these days. Consistency is the word of the day for this product. The coils last longer and there is no burnt taste when the coil is about ready to go. The only caveat is that you will need to puff harder to experience the vapour and flavour when the coil has fulfilled its use, though like we said, you are not getting a burnt taste at the end which is a big benefit. Furthermore, the e liquid burns really nicely. Moreover, many vapers have complained that changing the coil is difficult, but this is (again) not the case with the Endeavour Kit. In fact, this is likely one of the easiest e cigarette coils to replace. Twist it off, and lock in another one. It’s as simple as that. Now to the actual flavours: Apollo’s message on its website says “mixed by hand, packaged and stored in our lab.” Is this true? If so, who is doing this? Well, we looked into it and found that Apollo employs arguably some of the best mixologists on the planet. The finished products are downright incredible. From strict protocols in quality assurance to high standards, Apollo dominates the competition in the flavour category and is only outdone, in our opinion, by Green Smoke. However, even this is a bit difficult to compare since Green Smoke is a cartomiser e cigarette and Apollo isn’t. Apollo offers close to 50 different e liquid flavours. We only got around to trying half of these and they were all given, not surprisingly, top scores. This is the highlight area of Apollo as a company. As you are well aware, taste varies from person to person, however we really enjoyed RY4, Razzle, and Cappuccino. On a side note, you can expect about 250 puffs from each full tank which is respectable, but is nothing out of the ordinary. 24mg good for heavy duty smokers. 18mg a solid choice for mid to heavier smokers. 12mg for average smokers – what the vast majority of you should start with (see below on why you should start on this level). Now, as we mention on our home page, not all nicotine is the same. 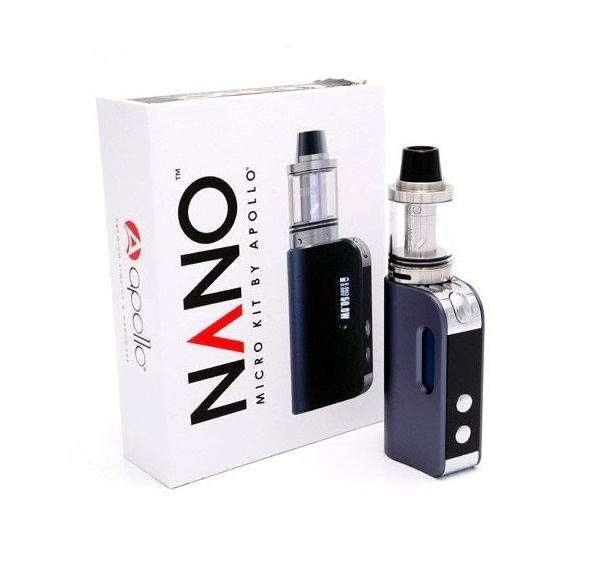 The Apollo battery is much stronger and the e-juice is very potent. Keep in mind that this has a sizable impact on the nicotine kick. You will feel a much stronger throat hit with Apollo’s 18mg nicotine than with Green Smoke’s 1.8% nicotine (which is the equivalent in this case). Therefore, we recommend regular smokers to start with the 12mg nicotine option. Remember, this is for anyone looking to break out of the beginner e cig stage. If this describes you, then you are most likely looking for a strong throat hit and wow does this product deliver a consistent throat hit! Though Apollo does not operate support 7 days a week, the actual level of support is very good when they are open. Officially, Apollo staff are there to answer your questions or inquiries five days a week, Monday to Friday, from 9AM to 5PM. You can get in touch over email and phone. Though they are technically closed on the weekends, if you have a question during that time, we have found that they answer emails sporadically during this time. That was a nice added benefit here. 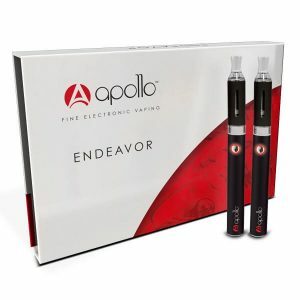 Now, Apollo does something great here for potential customers who are on the fence about purchasing their flagship Endeavour kit: if you are still unsure about it, for whatever reason, you can always go with the Endeavour-X kit for half the price. If you like it, you can then upgrade to the full Endeavour kit. Moreover, as you can see, there is one cig-a-like option (the Apollo Extreme Starter Kit). However, it is very difficult to find on their website. You essentially need to go to the Extreme Kit Cartomiser section in the header, scroll down to the components of the cartomisers and click on “Apollo Extreme Kit” (in the section where it says “Compatible with”). 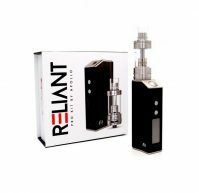 This kit, though, is inferior to V2 Cigs’s cig-a-like so if you are looking for a cig-a-like, we strongly recommend going with V2 Cigs. While Apollo does sell disposable cartomisers on their UK site, as we mentioned above, they only sell one cig-a-like kit. Apollo is not known for its cig-a-like products, though they are above average. Still, you can find better cig-a-like kits. Thus, you are “limited” to the e-liquid section. However, we shouldn’t say “limited” since there are 50 (brilliant) flavours to choose from. We could write an entire review about their e-liquids but we will keep it short. 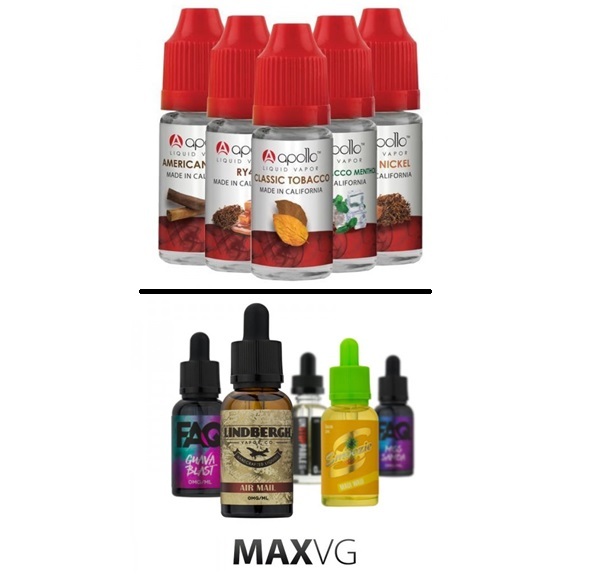 They are one of the best e-liquid producers on the market. In fact, in our opinion, they are actually better than most companies that focus on selling e-liquid such as Hangsen and Simply E Liquid. Good news and decent news here. The good news is that you can return the product within 30 days if you are not satisfied with it. You will need to get a RMA from Apollo before returning the product. The decent news is that they have a *limited* lifetime warranty….on the battery and electronic components only, and is for the “product’s lifecycle.” Generally speaking, a battery lifecycle is anywhere from 2-6 months depending on the e cigarette brand. This warranty is good for up to five replacements and can only be used within 60 days of your last purchase. Clearomisers come with a two week warranty. Keep in mind that if you use third party e liquids, the warranty will be considered void. All orders are shipped via Royal Mail with tracking. According to the Apollo website, orders generally take between 2-7 business days to arrive. From our experiences with Apollo, you will likely wait on the better end of that spectrum – 2-3 days. The great thing about Apollo is that you can track your order in your account on their website. We can’t stress enough how important it is to have real engineers on site building your products. Green Smoke is known to have invested millions in this. Same with V2 Cigs. But Apollo really took it to another level. 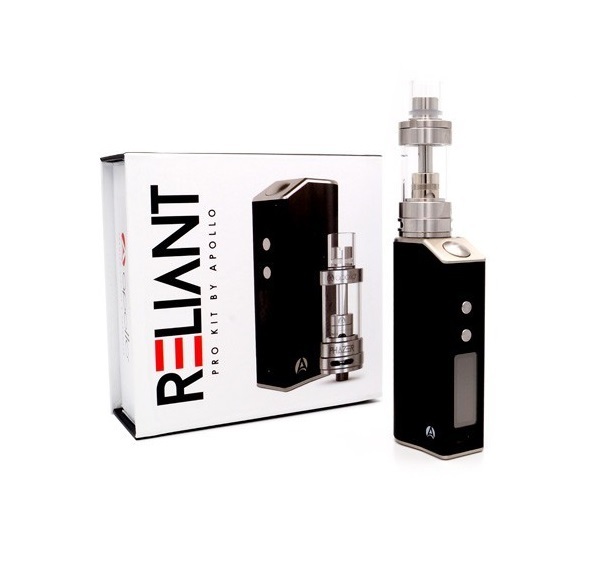 The battery performance and e liquids on their Endeavour tank system is in a world of its own. 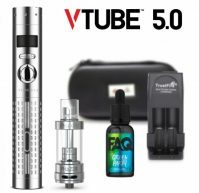 If you can get past the dull box design and really only care about the products, this is the e cigarette kit to buy, specifically if you’re looking to purchase a vape pen/tank system. You will not be disappointed. And if for some reason you are, you can always ship it back to Apollo under their 30 day money back guarantee – no strings attached.